Will be displayed Click the larger image! ■Let’s take a look at the video of DSK 250AB! Ancient bikes (motorcycles), so pictures and videos have been limited. Of course, fine data also we very often have questions becomes a rare but, let’s complete the article based on the materials at hand this time. Take a look at the DSK 250AB, there? I think that it is also he who felt. That’s right. It looks just like the BMW R25. Mark also looks just like BMW of DSK, is another complete rip-off. Model manufacturer that “DSK Automotive Industry Co., Ltd.” was launched in February 1959 of this bike. 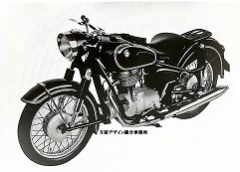 At the time The DSK, Daito Woolen Spinning & Weaving Company, Limited was a loom manufacturer independent Daito Seiki as a subsidiary of the (now Daitoubou Co., Ltd.) has entered the motorcycle industry. Why This DSK says whether you copied the BMW R25, this time, because it was a model that had been the highest peak, import and analysis, and was plump copy, is the circumstances that. The DSK 250AB is nicknamed “Densuke”, trouble is being imported ones such high quality from the BMW company! Maybe it was about was protest. By the way, the maximum speed is also well-known that it was the head family shame of ability that marks the 120km / h.
In fact DSK company will be in factory fire in 1957, DSK 250AB that management has sold into painful. After the production of 540 cars, motorcycle team is disbanded, became a legend of the manufacturer. It is very rare bike, but you or have been from time to time exhibition in Yahoo! Auctions. Ponponpon Tontonton I do not collect anything idling of sound and ~. The difference is the sound quality from the current single-cylinder 250cc, is the sound of ancient that really a Mekameka and of. Here, I who Tsure Ya a vintage sense of good feeling! Quite beautiful in spite of the year, also will DSK 250 That’s why even the look good like this rust. While production volume is less, it was a charming single with ability of enough to put an eye on Honke BMW!